Maureen's poem, "The Last Cigarette," was selected for The Best of the Best Canadian Poetry 2017 http://tightropebooks.com/the-best-of-the-best-canadian-poetry-in-english/, an anthology of 90 poems selected from the last 9 volumes of the Best Canadian Poetry in English -- "poems that have excelled twice"by being included in these anthologies. 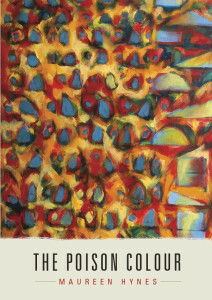 Maureen's most recent book of poetry, The Poison Colour, from Pedlar Press, was nominated for TWO prestigious awards for 2016 -- the League of Canadian Poets' Pat Lowther and Raymond Souster Awards. Read the League's interview with Maureen here. Sunday, Oct 29 Launch of The Best of the Best Canadian Poetry 2017, International Festival of Authors, Harbourfront Centre, Toronto. Saturday, Oct 28 11:00 am - 12:30 pm With poets Catherine Graham, Nicholas Power, and local historian, Daniel Burns, Maureen presents an Ireland Park Poetry Walking Tour (in the pouring rain!). Saturday, Oct 21, Maureen is honoured to be part of Another Story Bookshop's 30th Anniversary Bash and tribute to Sheila Koffman, co-founder of the bookshop and wonderful presence in the Toronto literary community. Sunday, May 14, 1:00-4:00 Join Tightrope Books at The Aga Khan Museum for the third annual Human Rights poetry event. Co-hosted by Tightrope Books publisher Jim Nason and author Farzana Doctor, and featuring readings related to human rights issues by ten acclaimed poets from some of Canada’s top independent publishers: Gwen Benaway, Michael Fraser, Maureen Hynes, Sheniz Janmohamed, Sonnet L’Abbé, Nyla Matuk, Soraya Peerbaye, Ann Shin, Vivek Shraya, Moez Surani. Amnesty International will be at the event with information about human rights issues. Auditorium, The Aga Khan Museum, 77 Wynford Drive, Toronto. FREE. Saturday, April 8, 1:00-4:00 The Annual Richmond Hill Poetry Gala. sponsored by the Richmond Hill Public Library, and hosted by Barry Dempster. With readings by Barry Dempster, Michael Fraser, Steven Heighton, Maureen Hynes, Soraya Peerbaye, and 2017 Griffin Prize nominee, Sandra Ridley. Richmond Hill Public Library, 13,085 Yonge Street, Richmond Hill . Wednesday Feb 15, 7:30 p.m. Maureen reads with Stuart Ross at Poetry London (Pre-reading workshop at 6:30pm), 167 Wortley Rd., London, Ont. Tues Dec 13, 6:30 -- David Clink’s Annual Dead Poets’ Reading. This year’s selections are read by poets from Best Canadian Poetry in English 2016. Maureen reads from Elise Partridge's The Exile's Gallery. Rowers Reading Series, The Supermarket, 268 Augusta Ave, Toronto. Thurs Dec 8, 8:00 pm – As part of a 3-day “Pedlar Press in the City” Festival, Maureen reads with Martha Baillie, Stan Dragland, Soraya Peerbaye, Sara Tilly & Craig Francis Power. The Ship Pub, St John’s, Newfoundland. Wed Nov 30, 7:30 – Launch of Best Canadian Poetry in English 2016, which includes Maureen’s poem, “Wing On,” The Brigantine Room, Harbourfront Centre, Toronto. Sat Nov 19, 11:30-4:30 Toronto's Indie Book Fair. Over 25 independent small presses at one gathering! Trinity-St Paul's Centre, 427 Bloor St W. Visit Maureen at the Pedlar Press table. Wed, Oct 26, 8:00 International Festival of Authors, Harbourfront, Toronto – “Sound and Verse,” a reading with Phil Hall, Maureen Hynes, Sylvia Legris, Mark Wagenaar. Wed, October 19, Cadence Reading Series, Sarnia, Ont. Friday, September 30, Moonstone Poetry Series, with Ruth Roach Pierson and John Reibetanz. Toast Cafe, Philadelphia, US. Sunday, May 29, 7:00 pm, at The Wickson Social, 7 St Joseph Street, Toronto, Maureen hosts readings by Jim Nason, Sue MacLeod, Michael Fraser, Vivek Shraya -- each with a new spring 2016 book of poetry! Tuesday, April 26, 8:00 p.m, Tree Reading Series, at Black Squirrel Books, with Adrienne Gruber. 1973 Bank St, Ottawa, Ont. Thursday, March 24, 8:00 pm. The Platform Reading Series, a series for instructors and students in the SCS Creative Writing Program (U of Toronto), at The Social Capital (formerly the Black Swan) 154 Danforth, 2nd floor. Maureen Hynes reads with her students, Jennifer Ann Burns & Julia Thomson; Christine Fischer Guy reads with her students, Charlotte Morrison-Reid & Margaret Ormrod. Wednesday, September 9, 6:00-8:00 p.m., a packed audience helped Maureen LAUNCH her fourth book of poetry, THE POISON COLOUR at Ben McNally Bookstore, 366 Bay Street, (2nd block south of Queen), Toronto. In March 2016, at Toronto's Poetry NOW: The 8th Annual Battle of the Bards Maureen competed with 19 other poets for a reading spot at Toronto's International Festival of Authors -- and won a spot! Sunday February 28, 2:00-4:00 p.m., Pillette Village Readings Series 2:00-4:00 pm at Nancy Johns Gallery, 4755 Wyandotte Street E., Windsor, Ont. with Ruth Roach Pierson. Sunday, January 17, 2:00-4:00, French Press Coffee House & Bistro, a reading in collaboration with next-door neighbour, Booklore Bookstore, and featuring Catherine Graham, Maureen Hynes and Ruth Roach Pierson. Orangeville, Ont. Saturday January 16, Red Head Gallery, 401 Richmond Street West, Ground Floor, Suite 115, Toronto, a reading to celebrate the Gallery's successful 25th Anniversary Exhibition, with Ruth Roach Pierson and other poets in tribute to artists who have inspired our work. Thursday, December 3, 7:30 p.m., lay your WORD΅down! reading series, Cobourg, Ont. The Human Bean, 80 King St W. Maureen appears as the evening’s “Guest Poet” with a 20 - 25 minute set; the rest of the evening is an open mike. Sunday, December 6, 7:30 p.m., Lit Live Literary Reading Series, Hamilton, Ont. Homegrown Hamilton, 27 King William Street. With Donna Langevin, Jonathan Ball, Pearl Pirie, Ruth Roach Pierson and Ron Schafrick. Wednesday, November 11, 7:00-10:00 p.m., (doors open at 7, reading starts at 7:30pm), RailRoad Reading Series, Pressed Café, Ottawa , 750 Gladstone Ave, with Ruth Roach Pierson. Wednesday, November 18, 8:00 p.m., Pivot Reading Series, Toronto. The Steady, 1051 Bloor St W. With Faith Arkorful, Matt Cahill and Karen Solie. Tuesday, October 27, 8:00 p.m., The Art Bar, Toronto. With Kurt Zybatiuk and Dilys Leman. The Black Swan Tavern, 154 Danforth Avenue. Friday, October 16, 7:30 p.m., Planet Earth Reading Series, Victoria BC, Hillside Coffee and Tea, 1633 Hillside. Monday, October 5, 7:00 p.m., Video Fag, 87 Augusta Ave, Toronto. "The Sweet Complaint; Four Queer Writers": With Brian Dedora, Vivek Shraya, and Kate Cayley. Thursday, June 11, 6:00-7:30 pm -- POEMS + ART + JUNE Poetry Reading, Gerrard Art Space Gallery, Toronto. Maureen reads with Sue Chenette, Ruth Roach Pierson, Patria Rivera and Norma Rowen. Saturday, July 4, 2015, 11 am - 1:00 pm – Pan Am Path Poetry Walk. The kick-off of a day marking the opening of the Pan Am Games and the legacy Pan Am Path project. Meet at St Matthew’s Lawn Bowling Club, Broadview and Langley ( north of Gerrard). Lost Rivers’ poetic exploration of the lower Don River with Maureen Hynes, Sue Chenette, Maureen Scott Harris, Dilys Leman, Nicholas Power leads into a day of celebration with nature hikes (led by Evergreen), heritage walks (led by Todmorden Mills), and multi-faceted creativity (with Urbanvessel, Native Earth and friends). Monday, March 23, 7:00 pm. Skanky Possum Reading Series. Maureen reads with Chicago poets Michael Autrey, Peter O'Leary and John Tipton. Toronto. Three poems of Maureen's appear on Canadian Poetries website for Sept 3, 2014: http://www.canadianpoetries.com/poetries/2014/9/2/maureen-hynes-three-poems. Maureen's poem, "Stone Sonnet," wins Honourable Mention in The Fiddlehead's Annual Poetry Contest. Fall, 2014. Thursday, June 12, 9:00 p.m. - 10:00 p.m. A QUEER READING! With Vivek Shraya, Trevor Corkum, Dani Couture, Maureen Hynes and Shawn Syms. The Steady Cafe, Toronto. Tuesday, June 17, 7:00 p.m. Boneshaker Reading Series, hosted by Lillian Necakov. With Nicholas Power and Maureen Hynes, St. Clair/Silverthorn Library, Toronto. Wednesday, May 28, 7:00-9:30 p.m. MORE THAN BODIES: A Fundraiser for Frontier College's Labourer-Teacher Program, The Women's Art Association of Canada, Toronto. Maureen Hynes, poet, and Elizabeth Ruth, novelist, interview each other -- about the work of writing, and writing about work and literacy, politics, feminism! Saturday, April 26. Ekphrastic Words: Four Poets Respond to Art in the City. A National Poetry Month reading, sponsored by the League of Canadian Poets and the Canada Council. With Jim Nason, Kelley Aitken, Jim Johnstone, Maureen Hynes in the “Sarabande” section, The Music Garden, 479 Queen's Quay West. The huge stone in the Poet’s Corner will be our stage. Thursday, May 1. Livewords Reading Series Black Swan Tavern, 154 Danforth Ave. The Toronto launch of Ruth Roach Pierson’s new poetry anthology: "I Found it at the Movies" from Guernica Editions with readings by: Alex Boyd, Sue Chenette, Catherine Graham, Maureen Hynes, Tanis MacDonald, Albert Moritz, Blaise Moritz, Jim Nason, Lillian Necakov, Molly Peacock, Jacob Scheier, Jim Smith, Adam Sol, Richard Teleky, and Kurt Andre Zubatiuk. Sunday, May 4. Mayworks / Jane’s Walk: Toronto Women’s Labour History Walking Tour. This customized tour acknowledges the Mississauga of New Credit, the aboriginal nation whose ancestral lands the city is built on, and highlights the struggles, gains and losses of women in the city’s labour and feminist movements from the 1850s up to the present. We bring back to life vibrant and committed women union leaders like Grace Hartman and Madeleine Parent; international figures like Emma Goldman and Amelia Earhart, and lesser-known Toronto women like Lily Ilomaki, a Depression-era union organizer. The tour is led by Tanya Ferguson, Jennifer Huang, Maureen Hynes, JP Hornick, Kathryn Payne and Sue Smith. About Face, a collection of poems and texts by ten authors inspired by Susan Low-Beer's sculpture exhibit of the same name. A Fieldnotes Chapbook exquisitely designed by Shani Parsons. Untying the Apron: Daughters Remember Mothers of the 1950s, Ed Lorri Neilsen Glenn. Toronto: Guernica Press. About Face, an anthology of writings in response to Susan Low-Beer's "About Face" sculpture exhibit. A Fieldnotes Chapbook. See http://susanlow-beer.com/. June 4, 2013 7:00 p.m. LORCATION! 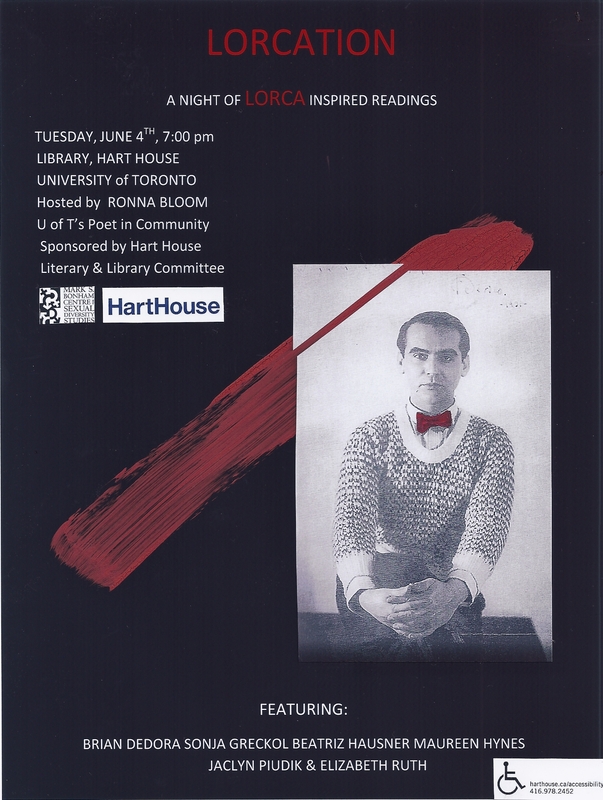 An evening of Lorca-inspired readings with Brian Dedora, Sonja Greckol, Beatriz Hausner, Maureen Hynes, Jaclyn Piudik, Elizabeth Ruth... and an appearance by Gerry Shikatani! 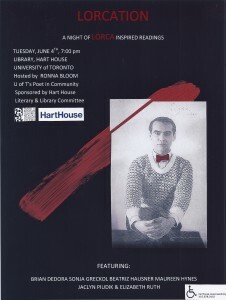 Hosted by U of T's Poet in Community, Ronna Bloom, Hart House Library, University of Toronto. Co-sponsored by the Hart House Literary and Library Committee and the Mark S. Bonham Centre for Sexual Diversity Studies. March 28, Harbourfront's "Battle of the Bards" -- 20 poets contesting for reading spots at the International Festival of Authors! Sept 20, Saint Mary’s University, Halifax, N.S.